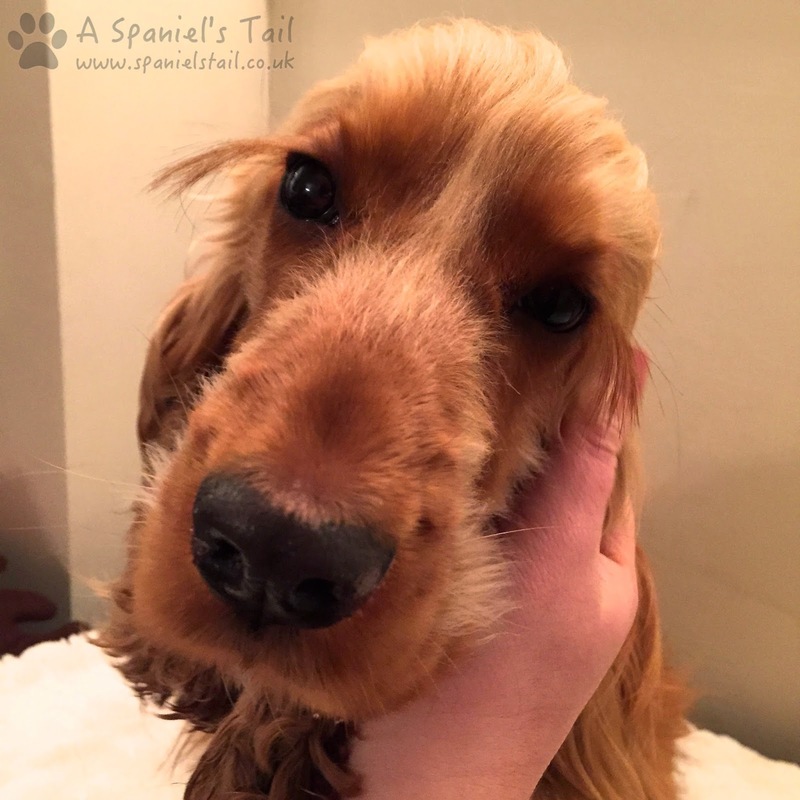 We recently posted a picture on our Facebook page of Lottie enjoying a lovely ear rub after her routine application of Thornit Canker Powder. This prompted a lot of questions, so we thought to answer all those questions, we would do a blog post about it. 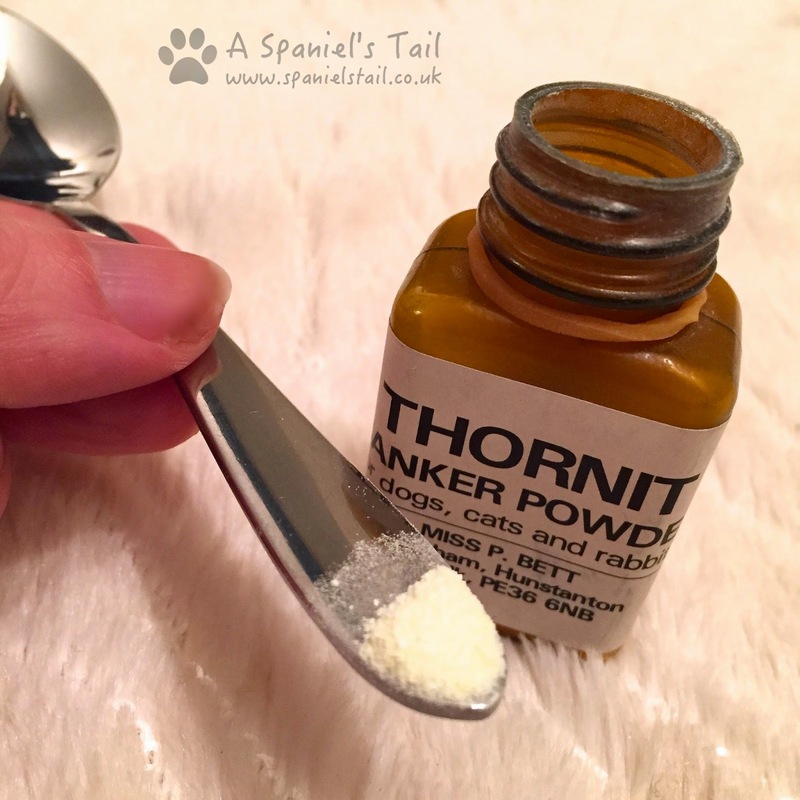 Thornit powder is simply an old remedy containing iodoform, which is used as a canker ear powder for dogs, cats and rabbits, by vets, breeders, owners and showers to improve and maintain their dogs ear health, since at least 1920. It is not a medicine, but is a very effective remedy for keeping ears clean and sweet smelling, particularly in those breeds of dogs that have long floppy ears, where air circulation is not great and can lead to a warm, moist environment. It can be used for ear health maintenance every few weeks, or it can be used more intensively to clean out waxy build up, ear mites, and to relieve sore, itchy ears. It does have a rather clinical smell (we had someone say it smells like a dentists waiting room! 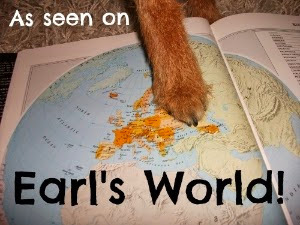 ), but if you are an oddball like the Hooman, you may actually like it! There are no antibiotics in Thornit, and it is very safe to use. 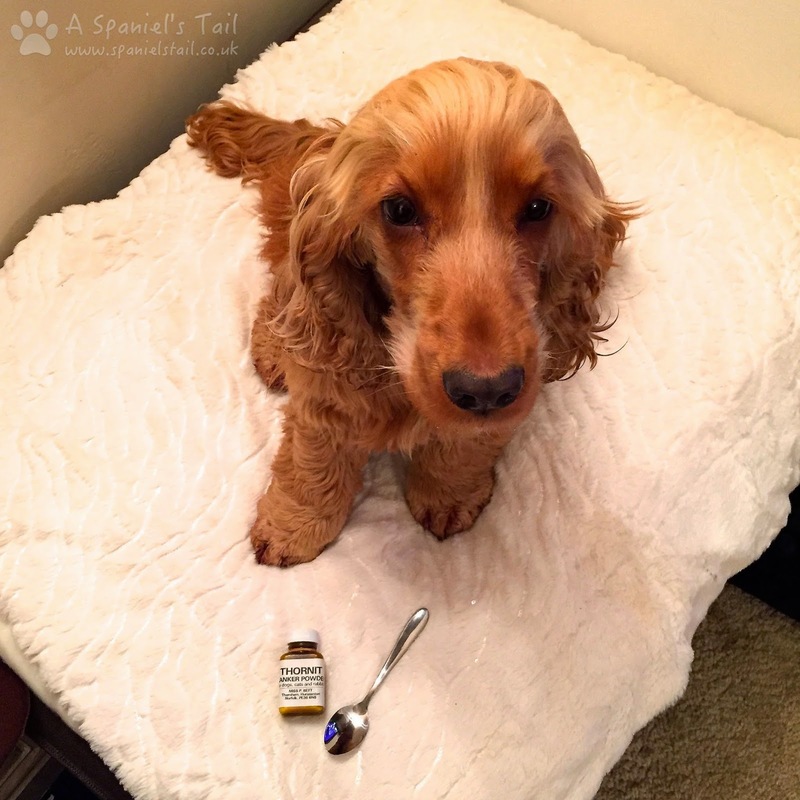 We use it once every 2-4 weeks, to maintain Lottie's ears (and touch wood, we have had no problems with them, even though spaniels are prone to them). If your dog is suffering with mites, indicated by dark brown waxy scabs, or by an offensive smell with pus globules, along with scratching, head shaking and rubbing ears on the floor, then you can use it more intensively, for example twice a day for 3-5 days, and then gradually revert to a "maintenance use", once the wax starts to come away / itchiness starts to subside. Application can be a bit tricky the first time you try it, but this is the method we use, with pictures! Open the Thornit, and using the non-business end of the teaspoon, especially if the first time, give it a good stir (it can clump up a little). Scoop out a small amount of Thornit (a pinch or two) onto the end of the teaspoon. This is how much we use. 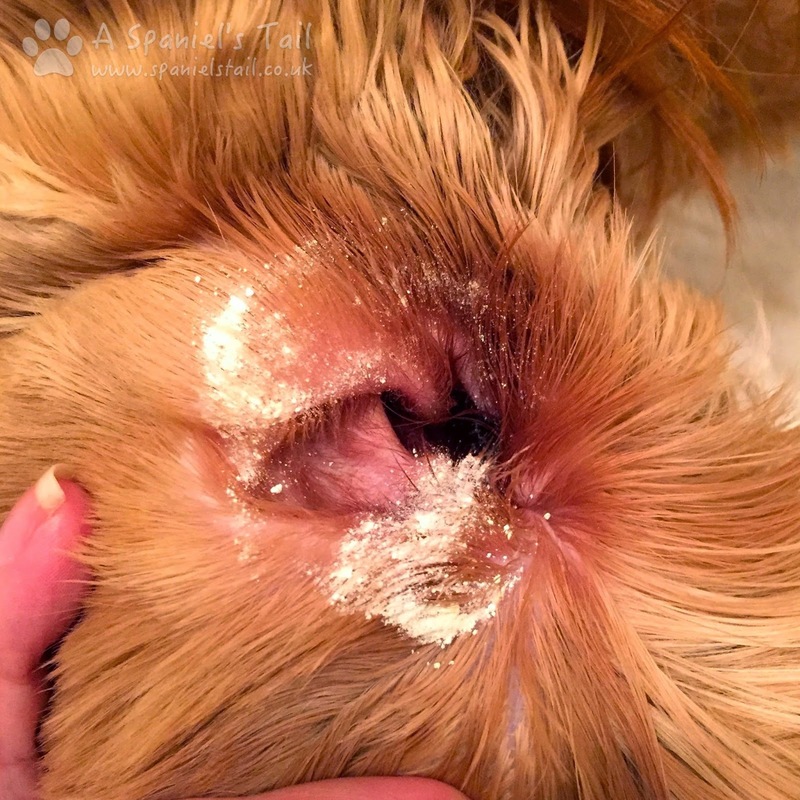 Lifting up the dogs ear, dust it around (try not to aim directly in) the dogs ear canal. Drop the ear, and commence vigorous ear rubbing - normally much appreciated this end, and accompanied by low moany noises and crossed eyes. From the dog. The best bit. Ear rubs! If your dog has hairy inner ears, you can also use it to gently strip out the hair around the ear canal - apply some Thornit around the hair, leave it for ten minutes, and then gently pull out. Keeping the ear canals hair free is also important to keeping ears clean and healthy. 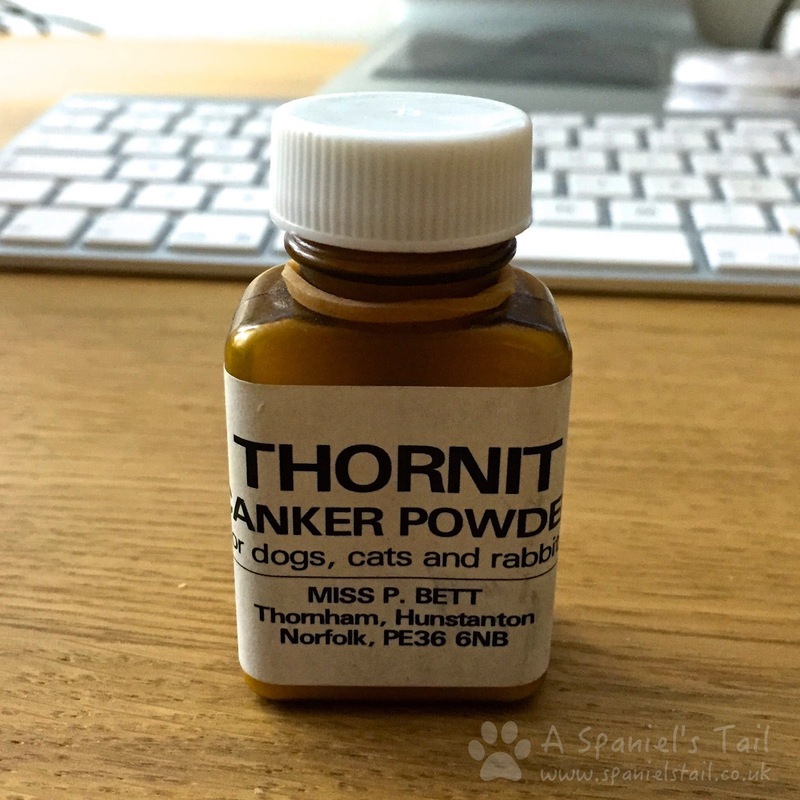 For itchy paws, put a pinch of Thornit powder in a small plastic bag and hold it closed over the dogs paw. Work it into the paw, between the toes and pads and a little way up the leg. Any other itchy areas, just apply a light dusting of Thornit to the skin (separate the hair on a long haired dog to get to the skin). Remember, a little of this powder goes a long way. I want to try it - where can I get it from? Disclaimer: I am NOT a vet and Thornit is NOT a medication. If symptoms do not improve, please consult your veterinarian. This sounds like amazing stuffs. Thanks, Lottie! Thanks for this, having read this I ordered some and Alfie now asks for it! Brilliant stuff. Great stuff. My dogs ear's have grown after using this. Thanks for the clear instructions. Have has Thornit and an itchy dog for weeks and now I know how to use it safely!